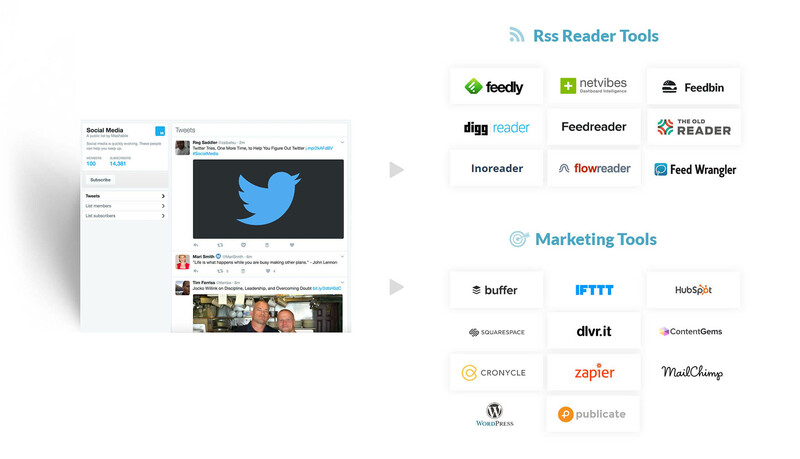 The Twitter RSS feed generator works with all your favourite marketing tools. Twitter is a popular source of fresh content. By creating a Twitter RSS Feed you can harness that power, and continually send the very best content from all of your favourite sources, straight to your RSS reader or marketing tools. The real power of converting Twitter to RSS is in content aggregation. Create a Twitter list and add each of your team members or employees to it. Now all of the latest Tweets from each team member will appear in that list. Use this Twitter to RSS tool to create a Twitter RSS feed URL from it and add it directly to Publicate, or any other newsletter builder that takes RSS. Now creating an interesting internal newsletter for employees, by employees, is as easy as drag and drop. People share great resources and insight at events. Bring it all together in your favourite RSS reader, like Feedly, so that you can easily read through it all and share or save the best bits. Just create a list of the attendees or a search result for the established hashtag on Twitter, and convert it to RSS using this Twitter RSS feed generator. Then all you have to do is add the Twitter RSS feed URL (s) to Feedly, or any other RSS reader and everything will be in one place. You can find expert thought leaders from any industry on Twitter. It is one of the most popular channels for them to share their best content and opinion. Tap into this fresh content by creating a Twitter list of the top thought leaders in your industry. Once the list is set up, get your Twitter RSS feed for it, and add it to Buffer. A steady stream of quality content will automatically flow in, ready for your to filter through and create social shares from, all within one platform. If you are stuck for whom the thought leaders are in your industry, check out Buzzsumo, it will help you to figure out who they are. You can create a private list on Twitter of all of your competitors. Making it easy to keep an eye on their latest updates and Tweets. But those Tweets are no good just left in a list on Twitter, you’ll never read them, and nor will your team. Instead convert that Twitter list using the Twitter RSS feed generator and send every Tweet straight to a Slack channel by adding the URL as an RSS source. Create a destination for your customers to catch up on only the best content from the industry. Use Twitter to set up the appropriate lists, searches or hashtags that tap into the best sources. Then convert them into a Twitter RSS feed, and add the URL to an RSS reader. Now all of the content is flowing into a single place, ready for you to sort through and save the best bits. If you use Feedly, you can save the best content onto relevant boards, and then connect those boards to Publicate, so all of the content is automatically in your library. Ready for you to create your resource hub, directly in Publicate. One of the biggest problems with content online today is how much of it there is. Your readers are having to sift through hundreds of articles everyday. Why not provide them with massive value by filtering out the best of the best, and send it straight to their inboxes, in a well formatted curated newsletter? Use the Twitter to RSS generator to convert hashtags, searches and lists into a Twitter RSS feed URL and add it directly to Publicate. All of the content will flow into your library, ready for you to just drag and drop into a template. Sorry, that email link is out of date or has already been used. Please try resetting your password again here.